Without a doubt, The Legend of Zelda: Breath of the Wild has been one of the top video games of 2017. Nintendo’s game also recently won big at this year’s Game Awards, taking the Game of the Year award home on December 1. The game’s beautiful open world and free-form gameplay certainly won Nintendo a lot of fans this year, then, while also helping give the Nintendo Switch a major boost too (in fact, it can be argued the game can be considered Nintendo’s console killer app). Of course, it’s not hard to notice that Breath of the Wild has plenty in common with other open-world games released to date, and comparisons to genre classics like Skyrim are inevitable. After all, Bethesda’s wonderful game was arguably the best role-playing open-world game until it was dethroned by Breath of the Wild this year. And in an interview with GameSpot, Nintendo producer Eiji Aonuma did admit the team looked at Skyrim during Breath of the Wild’s development phase. “In the past I’ve also actually said that I have played Skyrim, so it’s not necessarily that I don’t play games”, said Aonuma. 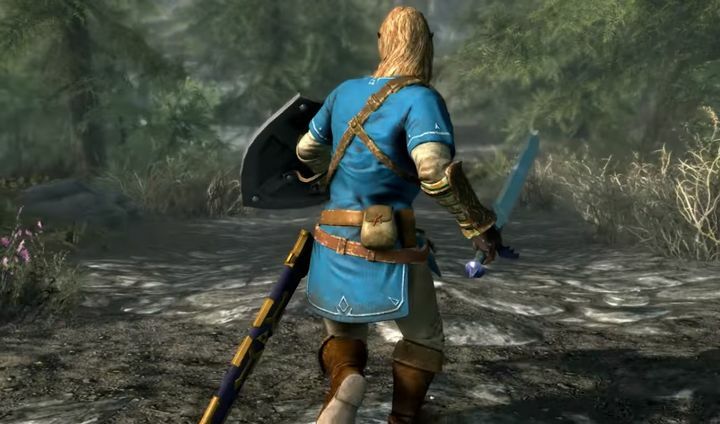 Nintendo’s intention was not to rip off Skyrim, of course… Rather, Zelda’s devs played Skyrim in order to figure out what gamers would expect from a grand, open world adventure like Bethesda’s game, as Aonuma explained. “But we don’t look at it from, ‘Oh, what kind of things can we take from this game?’ It’s more of like, ‘How can we prepare for this? What should we expect from games like this?’”, said the Nintendo producer. This also helped Aonuma figure out how many people would be needed to make the latest Zelda game, and collect data during the research phase of the game-making process to figure out what features would work and which wouldn’t. And it’s clear that Nintendo got The Legend of Zelda: Breath of the Wild right judging by the overwhelming positive player and critical response, helping the company sell millions of Nintendo Switch consoles this year too. So, it would be a great thing if the Japanese company came up with a Zelda sequel in the not so distant future, while Nintendo has kept adding to Breath of the Wild with expansions like the Champions Ballad DLC, which was released this month.